What have I accomplished since the last meeting? What do I plan to do for the next meeting? What impediments are in my way? When teams don’t hold a daily standup meeting, the team risk losing the communication, focus and momentum of a team necessary to build the right product with the appropriate quality on time. Oftentimes, teams will have all kinds of excuses for avoiding the daily stand up meetings. The daily scrum, however, makes teams more successful because it is the smallest feedback loop embedded into the Scrum Sprint, just like you having exercise every day for 5 mins. It’s a good daily habit to make and will pay off in the long run. 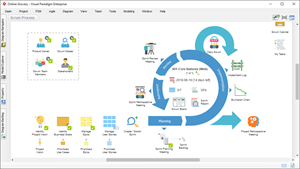 What is Scrum Daily Standup? The Daily Standup meetings ( also referred to as the stand-up, morning rollcall or “daily scrum) are usually time-boxed to between 5 and 15 minutes, and take place with participants standing up to remind people to keep the meeting short and to-the-point. The meeting should take place at the same time and place every working day. All team members are encouraged to attend, but the meetings are not postponed if some of the team members are not present. One of the crucial features is that the meeting is a communication opportunity among team members and not a status update to product owner, or stakeholders. 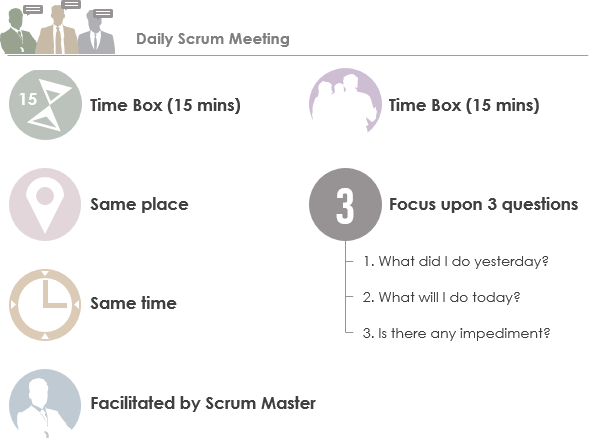 As a scrum master of the scrum meetings, it’s useful to have a template for the meetings. Please find below a simple templates below. Standup meeting means that everyone stands up! What have I done since the last scrum meeting (yesterday)? What will I do till the next meeting (tomorrow)? Are there any impediments (that prevent the stories getting done today)? Focus on the time frame – if there are long discussions – discuss it after the daily scrum or organize a separate meeting. The team does not report the scrum master – it’s a discussion, not a reporting. Members are talking to each other’s, not to the product owner or scrum master. What to do when a member is too late? – Tips: one coin into the piggy bank which will be donated for some drink for the team. Team members do the work – it’s not the scrum master who is updating tasks, burndown charts or whatever.